An Oscar-winning movie legend, an accomplished actress of stage and screen and a cross-dressing stand-up comedian. Quite a diverse trio makes up the British voice cast of Cars 2, Pixar's hit summer release now available on Blu-ray, DVD and movie download. Even with their varying backgrounds, though, the Brits easily found a common ground in their admiration for Pixar and director John Lasseter, despite never getting to see each other during production. 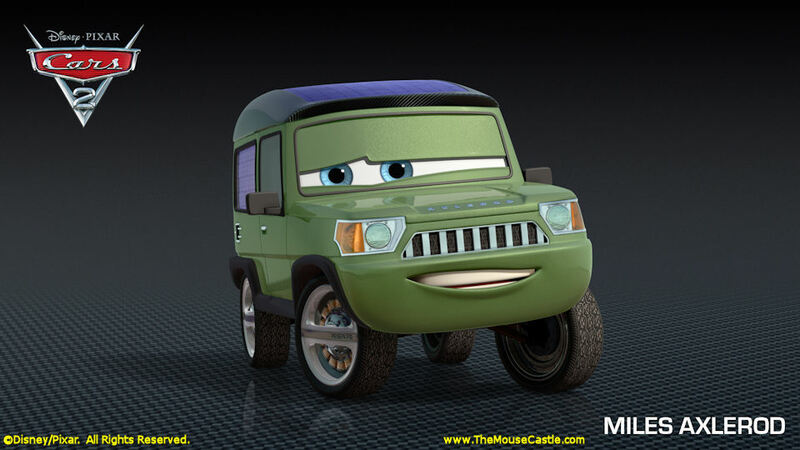 Comedian Eddie Izzard voices Sir Miles Axlerod in Cars 2. "I love doing animation," says Eddie Izzard, the voice of Cars 2's Richard Branson-esque tycoon and adventurer Sir Miles Axlerod. "But, I get upset that I never get the chance to meet the other actors in the movie. It never happens. We always record our dialogue alone in a sound booth. We don't meet each other until the promotional stage. It always feels a little strange to meet someone for the first time, even though you've been working on the same project for a couple of years." Izzard is no stranger to animation, having voiced characters in several other films, most notably the caustic koala bear Nigel in The Wild. Sir Miles, the racing promoter who brings Lightning McQueen and a host of international race cars together to compete in the World Grand Prix, was somewhat of a departure for the comedian, who's more prone to waxing funny on topics ranging from religion to Stonehenge to evil giraffes, oftentimes doing so in full drag. "When it comes to Sir Miles Axlerod," he says, "I just had to be as real as I possibly could, but not use any of my comedy skills. I had to play Miles as a very straight-laced character, so I was very jealous of other actors like Larry the Cable Guy (Mater) who got to use their comedy chops in the recording booth." Also playing it fairly straight (as straight as you can in a world of talking cars) was Emily Mortimer, daughter of the late author and screenwriter John Mortimer (Rumpole of the Bailey). Emily took a direct approach to her character, the earnest and competent spy car Holly Shiftwell. Says she, "They just wanted me to play the character from my own personal point of view. Obviously, she's a spy car and there are lots of technical words to get my mouth around, but I just put myself in her situation. I imagined that I was going through whatever she goes through in the story." 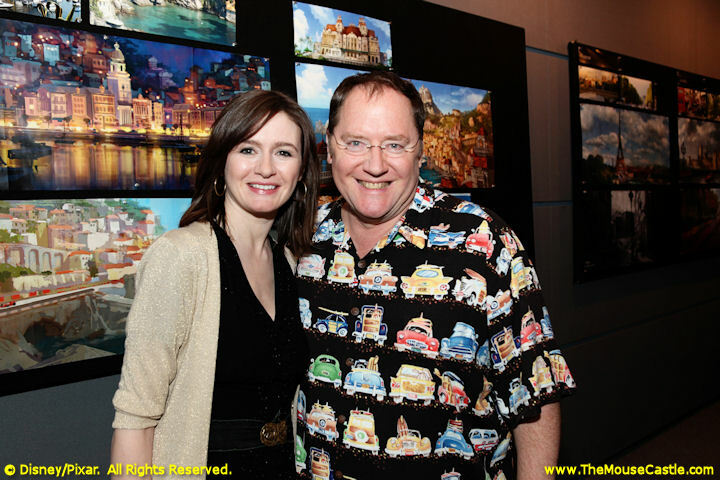 Emily Mortimer (l.) with Cars 2 director John Lasseter. Emily put a lot of faith in director John Lasseter to help her find the heart of her character, a challenging feat when you're grinding away alone inside a recording studio. "Everything is very slow and gradual on an animated film," says Emily. "It's not like on a regular movie where you're given a shooting script and you know everything that's going to happen. You're completely reliant on the director to paint a picture and give you a feeling of what's going on. It's a very organic process. "I found myself completely relying on (John Lasseter). He would guide me through the story and you know you're in safe hands with him. I would have freaked out if it had been anyone else, but John was amazing." More comfortable in the recording studio was Academy Award-winner Michael Caine, a veteran of radio, movies and television for over 50 years. "I've done a lot of radio in my life," he says. "I did a number of radio plays for the BBC when I was young, so I'm used to the style of work where you just use your voice. Projects like this are always great for me because I have a very distinctive voice. I open my mouth and everybody knows it's me." London concept art with "Big Bentley" in the background. For Cars 2 to take its main characters on a trip around the world beyond the safe confines of Radiator Springs, authenticity was key. Destinations such as Tokyo, Paris and the fictional Porto Corsa (a cross between Portofino, Italy and Monaco) were designed by the filmmakers to look as real as possible, even in a world populated by cars. To create London, the Pixar artists designed close to 20 miles of environment and landscape, an effort not lost on the British cast. "The attention to detail is outstanding," says Izzard, "especially when it comes to the London scenes in the film. I've run the London Marathon, so I know certain areas of the city intimately. When the film pans along The Mall towards Buckingham Palace, I've run there and that is definitely the London that I know. 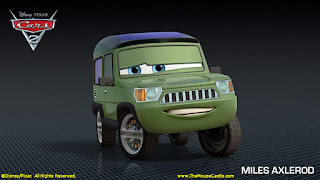 They've done a fantastic job in recreating it in a Cars style." Adds Caine, "I think it requires a great deal of patience to create an animated film and I have very little patience. John Lasseter is a fabulous director and he must have tons of patience. He's very good with actors. The actors' relationship with the director when you do these sorts of movies is far more intimate than it is with a director on other movies. He's the best."